Today’s stylish London wedding is proof that, sometimes, less is more. With a small guestlist of friends and family who flew in from all over the world, Australian-couple Gemma and Daniel were able to ensure that everyone was seriously well looked after, opting for a private room at Somerset House and gifting Evermore candles as favours (not to mention a pitstop for espresso martinis between the ceremony and reception; one way to make sure all your guests get where they need to be on time!). The monochrome styling – with white bridesmaids dresses, black tuxedos and white roses – is seriously sophisticated and a timely reminder that often the colours which shine brightest are the classics. Well, isn’t this wedding the height of sophistication. 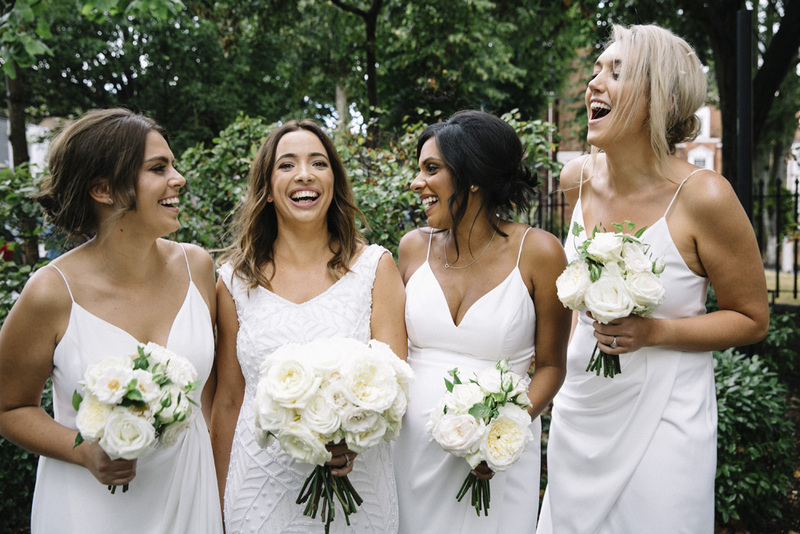 The bridesmaids look stunning in their strappy white Shona Joy dresses, which flatter all three girls fabulously; can you even tell that Gemma’s best friend has a seven-month baby bump? Complemented by the groom and his groomsmen in black tuxedos – which Daniel requested be slightly more fitted than standard (perfectly reflecting our mantra of your day, your way) – this group are definitely bridal party goals. Here at RMW, we love a city wedding, and the Big Smoke offers so many options depending on your style. Whether you want your celebration to be contemporary or classic, busy and brash or off the beaten track, our couples have done it all and we have loads of inspiration for London weddings, so bookmark this page and get browsing! Groom and Groomsmen’s Suits Edit Suits Co.